Most homeowners would agree that having good indoor air quality is a priority. But, balancing indoor air quality and energy efficiency can sometimes be challenging. At Quality Air Heating and Air Conditioning, we know how to make sure that your heating and cooling systems are helping to improve the quality of your home. 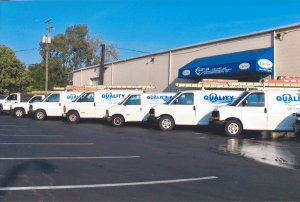 Maintaining high indoor air quality efficiently in Columbus, OH is as simple as calling one of our air quality experts. If you have questions or concerns about your home, don’t wait; call us today! Luckily, energy efficiency and reducing heating and cooling costs go hand in hand. That’s why you want to make sure that your air cleaner, air purifier, dehumidifier, and other air filtration devices are working properly. Allergens, germs, dust, odors, smoke, mold, and high humidity can present problems to everyone in the home, especially those who suffer from seasonal allergies or asthma. Air cleaner. Air cleaners are either mechanical or electronic. Conventional mechanical air cleaners use HEPA filters, which can remove up to 99.7% of all airborne particles 0.3 microns or greater. These are less expensive solutions for homeowners concerns about viral and bacterial pollutants. Electronic air cleaners work by electrostatically attracting particles, and removing them from the circulating air. Air filtration. Most air filtration systems are whole-home systems that work in conjunction with your existing heating and cooling system to provide high-efficiency air filtration. Whether HEPA, electrostatic, or pleated MERV filters, air filtration systems are an effective and efficient way to remove harmful particles from your indoor air. Dehumidifier. While your existing cooling system provides its own dehumidification process, it is often an inadequate humidity control solution for the entire home. Whether you find humidity uncomfortable or not, certain allergens thrive in high moisture conditions, such as mold, dust mites and bacteria. UV Germicidal lights. Well-placed ultraviolet radiation in your air handler can eliminate the breeding grounds for microbial growth and ensure that the air circulated throughout your home is clean and pure. There are many ways to maintain high indoor air quality efficiently in Columbus, OH. Call Quality Air Heating and Air Conditioning today to schedule a consultation with one of our air quality experts.